Stephens City was chartered in 1758 as the town of “Stephensburgh,” but its origins reach back into the early 1730s when Peter Stephens (1687-1757), an immigrant originally from Heidelberg, Germany, built his homestead on land that would eventually become part of the far southern end of the original town. Stephens and his family, along with other German immigrants, came to the Valley of Virginia after spending some years in the Skippack Creek area outside of Philadelphia, Pennsylvania. Chief among this group of German colonists was Jost Hite (1685-1761), one of the purchasers of a large land grant in the lower Shenandoah Valley from the Governor of the Royal Colony of Virginia. Hite, Stephens and other German Protestants came to the Shenandoah Valley as early as 1732 and established the “Opequon Settlement” south of what would later be known as the town of Winchester. This Opequon Settlement was not a town but a group of homesteads on land claims held by these early pioneers. Their land claims mostly stretched along the rich bottomlands next to the streams that emptied into the Opequon Creek and the Shenandoah River. These first homesteads were found in the area around the “Indian Road” or the “Great Philadelphia Wagon Road” (U.S. Route 11), in the core of what is today the central and southern part of Frederick County, Virginia. Hite settled on the north bank near the headwaters of the Opequon creek in what would later be known as the community of Bartonsville. Peter Stephens established his claim on the North Branch of Crooked Run, a stream that would later be named Stephens Run in his honor. Shortly thereafter, an informal community of Stephens’ family members and their associates began to grow up along the Great Wagon Road around the Stephens’ family homestead. Peter Stephens and his wife Mary had seven children. The oldest of them, “Ludwig,” or Lewis, had been born in Germany in 1714 and was already a young man by the time his father moved the family to Virginia. As early as 1736 Lewis was authorized by the county government to keep an “Ordinary,” or what we might call a roadhouse or tavern, at his home in the Stephens family settlement. It is unclear how long Lewis Stephens operated this ordinary in the new community associated with the Stephens’ family land claims. We do know Lewis was married around 1740 to Mary Rittenhouse and shortly thereafter began purchasing land from Jost Hite and others. One of the other important local property owners who sold land to Lewis Stephens was Thomas, 6th Lord Fairfax, Baron of Cameron (1693-1781). Lord Fairfax came to Virginia in 1735 to see for himself the lands he had inherited through his mother, Catherine Culpeper, Lady Fairfax. He liked what he saw, and after living east of the Blue Ridge for a number of years he eventually chose to settle and build his manor home “Greenway Court” just west of the Shenandoah River near what would become the community of White Post, eight miles east of Stephensburg, in modern Clarke County. Lord Fairfax’s maternal grandfather, Thomas, 2nd Lord Culpeper, had secured a patent from King James II in 1688 ensuring that all of the lands between the headwaters of the Rappahannock and Potomac rivers belonged to him and his heirs. Thus, Lord Fairfax claimed all of the lands in the Northern Shenandoah Valley, including the lands already granted to Jost Hite, Peter Stephens and others by the governor of Virginia. While Jost Hite fought Lord Fairfax’s claims in court, Peter and Lewis Stephens chose to work with the Baron and remained friendly toward him. In 1745 Lewis Stephens purchased 195 acres on Cedar Creek, about seven miles to the west of his father’s home, where he built a house for himself and a water powered mill. With the outbreak of hostilities on the frontier that would eventually become known as the French and Indian War, Lewis Stephens served as an officer in the Frederick County militia reporting to the young George Washington. Local tradition maintains that as part of this war effort Lewis built a hexagonal stone powder magazine that reaches deep into the ground near his house and mill on Cedar Creek. 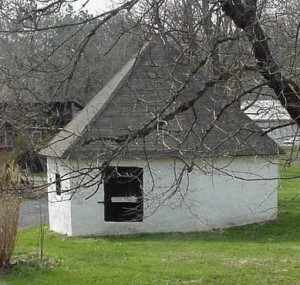 This powder magazine, which still stands today, was later used by Isaac Zane when he produced artillery munitions for the Revolutionary War, and eventually as an icehouse. This site was known as “Stephens Fort” and most likely was encircled by a log stockade during that war against the French and their Indians allies. Tradition relates that Fairfax was much more partial to Stephensburg than he was to Winchester, and used all his influence to make Stephensburg the seat of justice, but … [James] Wood [Winchester’s proprietor] out-generaled his lordship, and by treating one of the justices with a bowl of toddy [or spiked punch] secured his vote in favor of Winchester, which settled the question, and that Fairfax was so offended at the magistrate who thus sold his vote, that he never after spoke to him. Thus, despite the early efforts of Lord Fairfax, Winchester was chosen over Stephensburg as the permanent seat of Frederick County, Virginia government. From that time on, Stephensburg would have to grow on its own merits. After the war Lewis began to establish an ironworks on his tract at Cedar Creek. This ironworks was intended to produce pig iron and wrought bar iron. Lewis continued to live on this tract and work on the iron furnace until 1767, when Lewis sold this 195-acre-tract to ironmaster Isaac Zane (1743-1795). After the sale Zane made Marlboro Furnace into a very successful iron-manufacturing business. At that time Lewis Stephens moved back to the family lands that he held in reserve in Stephensburg and focused his attention on the development of the new town. By the start of the Revolutionary War, Stephensburg was becoming known by a nickname that would eventually become part of its official designation. In some documents of the period we find “New Town” or “Newtown” being used to identify Stephensburg. It is hard to know when this nickname was first used, but it is likely that it had something to do with the fact that Stephensburg was the “new town” on the Great Wagon Road south of Winchester. By the time of the Civil War, this nickname of “Newtown” had become almost exclusively the only name for which the town was known. 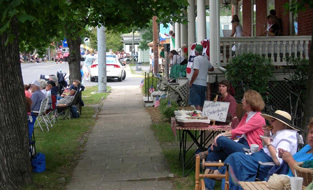 Many who journeyed south, up the Valley, during this period rested from their travels in Newtown/Stephensburg. Fortunately one of these travelers kept a journal. On 23 May 1775 a young Princeton educated Presbyterian minister named Philip Vickers Fithian (1747-1776) came to Stephensburg to stay while he preached to nearby congregations. He described the town as “A small Village—Well situated—4 Taverns kept in this Town—One large Store kept by Mr. Holms where I am to lodge.” On 29 May 1775 Fithian described the town’s setting in his journal. It is, in its Situation, very delightful; from it there is a good View of both the North & South Mountain, the first fifteen, and the other thirty Miles Distance. From this Town may be seen, six Counties and there are but few such Prospects in America Hampshire, Dunmore, Culpepper, Farquier, Loudon, Frederick!—The Mountains, on a smoky, or dusky Day, appear vastly beautiful—Like a fine well-designed, & finished, Piece of Paining! Fithian left shortly thereafter and joined the fight for American independence. During the Revolution a number of young men from Stephensburg served and died for the cause of American independence. One group of Stephensburg’s patriots was recruited in August of 1776 by Henry Bedinger (1752-1843) of Shepherdstown and joined other rifle troops from Martinsburg in Berkeley County to the North. They were marched to New York under the command of Captain Abraham Shepherd (ca. 1753-1822) of Shepherdstown. There on Manhattan Island during the Battle of Fort Washington on 16 November 1776, a British and Hessian force that outnumbered them by more than 5,000 captured the 2,818 Americans defending Fort Washington. Among the captured was one Conrad Cabbage of Stephensburg, the son of George Cabbage, the builder of the Stone House that is now part of the Newtown History Center. Conrad suffered the same fate as the other men of his unit who were from Stephensburg. He died 7 January 1777 of starvation and disease incurred through the intentional neglect in his British captors. Another prisoner from Stephensburg who died in this same way was Gabriel Stephens, a grandson of Peter Stephens. The town of Stephens City has a long history spanning over two and a half centuries. From its beginnings in the 1730s and through the French and Indian War, the Revolutionary War and the Civil War, the town and its inhabitants witnessed and participated in events of national significance. After the Civil War into the twentieth century the town suffered through a forced name change and economic hardships associated with the general advancements in transportation technology. Today the town faces unprecedented growth along with other towns in the Northern Shenandoah Valley. Please click on the links below to read about the various eras of the town’s story. These pages are for those who are seeking a concise but thorough historical account of the history of Stephens City. If you have more specific questions, please contact us and we will be happy to try and answer them for you.